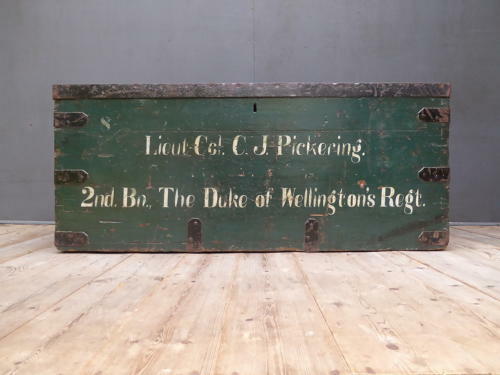 A beautiful example of a large antique military campaign trunk. A wonderful zinc lined campaign trunk in solid teak in its original painted finish with signwritten detail to the front panel. The trunk has a fantastic patina, a beautiful soft sheen & is finished in the traditional manner with extensive iron banding, oversized hinges & carry handles to either end. Colonel Charles James Pickering was born in Dewsbury, Yorkshire in 1880. At the tender age of eighteen, he began his military career with the British Army, serving with the King's Own Yorkshire Light Infantry & a few years later, joined The Duke Of Wellington's Own Riding Regiment where he served on & off until late 1933. During his time with the regiment, he was awarded various medals & honors & was wounded ion his right arm while conducting a night inspection in 1915. Colonel Pickering died in Alverstoke, Hampshire in 1951. (Cred: livesofthefirstworldwar.org). Wear commensurate with age, good solid condition. Lightly cleaned & ready for use yet unrestored showing pleasing signs of its well travelled past. The inner zinc lining has a few holes & one end handle is a little out of shape. The photographs do this trunk no justice, the depth of colour to the paintwork is far better in the flesh! The trunk weighs in excess of 45kg so will need to be sent via private courier, please enquire for details.